The ultimate in pocket reference books for professional search and rescue. Each coil-bound guide is printed on 100% waterproof paper that can be repeatedly soaked, washed (up to 60°C) and disinfected without damage. Unlike many other 'waterproof' notebooks that rely on coated paper, ProGuides are printed on polymer sheets using our own unique process - they can be written on, are resistant to abrasion and tearing, and will not stick together after months festering in a damp pocket. We use the latest ditigal printing technology, with crystal-clear text and graphics specifically designed to be legible in all lighting conditions. Designed to deliver in the worst conditions possible. 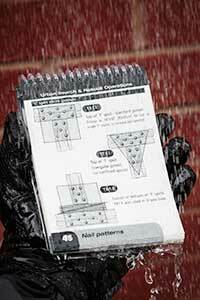 Rugged plastic covers protect the ProGuide, and smooth corners protect your pocket. Unique measurement overlays specific to each subject. Corrosion-proof non-magnetic plastic coil binding. A6 (105mm x 148mm) page size fits neatly in uniform and trouser pockets, including Wolfpack/Molle USAR harnesses. Pages can be written on with ballpoint pens, markers, chinagraph, etc. Content is fully compliant with established standards and protocols, and is written by world-leading experts in each field. Cutting-edge computer-generated artwork is clear and easy-to-understand even in extreme conditions and low light. Branded covers and custom inserts available on request, subject to a small fee or minimum volume. Relied upon by thousands of rescuers in every corner of the world - get yours today! Standard issue to rescue teams on every continent. Our world-famous USAR book just got better! INSARAG-compliant with improved graphics and extra content, still at the same price! 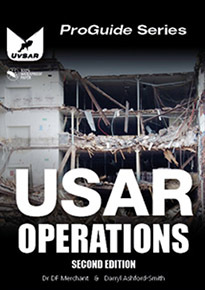 Over 100 pages, covering the full range of information needed by operational members of a USAR, disaster response or NGO rescue team. A complete Safe Work At Height (SWAH) and Line Rescue guidebook for Fire Service, industrial and other rescue teams working in the UK or to UK-style policies, covering everything from basic principles to advanced rigging and rope access. 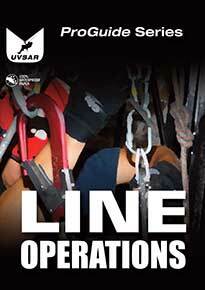 The Second Edition of USAR Operations is available! Still leading the game with the best quality and range of information, we now follow the latest INSARAG search and mapping guidelines.